This month, William Rupp, one of our own parish at St Peter and Paul Byzantine Catholic Church was ordained a deacon. 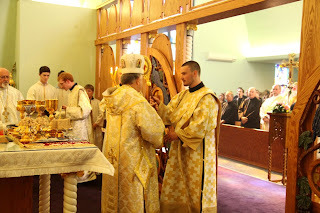 This ordination is part of the seminarian’s journey, which for some result in ordination to priesthood. Will is one of very few seminarians in the Byzantine Catholic faith. I was asked and honorably accepted to be the official photographer for this great ceremony. Many priests, deacons, nuns and others from the Byzantine and Erie Catholic community joined us in this moving ceremony. The church was very full with our guests, and many from our parish who came to share in Will’s ordination ceremony. The ordination is a very important ceremony in our church. The Byzantine churches are in need of priests, and for our small parish to have William enter the seminary and become ordained a deacon is a great honor and makes us very proud. In the Byzantine churches, the traditions are strong. The services are all sung a capella, with no instrumental accompaniment. The archeparchal choir from Pittsburgh all came up to sing a powerful liturgy, rich with variations on the song of “Christ is Risen!”, sung from Easter until Ascension. Our own Metropolitan Basil, the archbishop of the Byzantine branch of the Catholic Church, led the ceremony and personally ordained William. William’s new title is “Father Deacon”. He recently celebrated liturgy at our church with our own Father Andrew Deskevich, and will be assigned to another church for his deaconal duties this summer. Many congratulations to Father Deacon William! We hope to see him soon again at our parish, and wish him well in his final year at Seminary. Today I took photos at a special liturgy (mass) in recognition of the priests, nuns and members of the monastery of our Byzantine Catholic Church. 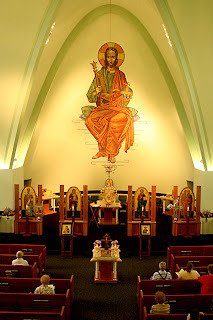 Our church, St. Peter and Paul in Erie, PA, is in transition from the more contemporary Latin influenced style of the late 20th century to the more traditional Byzantine style complete with painted icons, an iconostas (icon screen), and new restoration all over the church. Here’s another session that I shot in available light, combining window light through stained glass and flourescent highlighs in the church. Most of the images were at very high ISO and low shutter speed which I shot with a variety of lenses on a monopod. The church restoration will be complete next June and we will have a great rededication ceremony for the church and our growing community. One interesting difference between Byzantine Catholic and Roman Catholic is that the entire service (divine liturgy) is sung and chanted – there are no musical instruments. It is very solemn and spirutal.